I love Chinese food. That being said, my pantry and fridge are a pathetic sight to anyone who even remotely knows how to put together a decent Chinese dish. I’ve got a nub of ginger that takes up permanent residence in my freezer, some fish and soy sauce hanging out on the fridge door shelf and an old jar of chili paste I found hidden in the pantry unopened. I was talking with Julie a couple of weeks ago about some tofu ideas (hi, I’m a walking stereotype. Let me just ask my Asian friend what she does with tofu.) 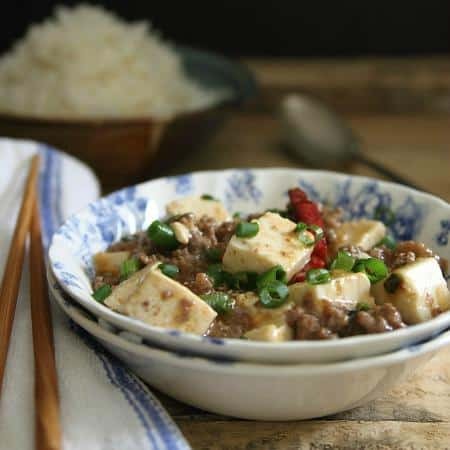 and mapo tofu came up as something her mom makes all the time. A little googling and I saw a delicious Chinese dish in front of me with at least five crazy ingredients I will likely never use again in my lifetime. So I set out to make a mapo tofu dish at home using accessible ingredients and not stuff like fermented black beans and Sichuan peppercorns. Wha??? And if I do say so myself, the result is pretty stellar. Like legit Chinese food, you could sell this to people and they’d totally pay for it stellar. 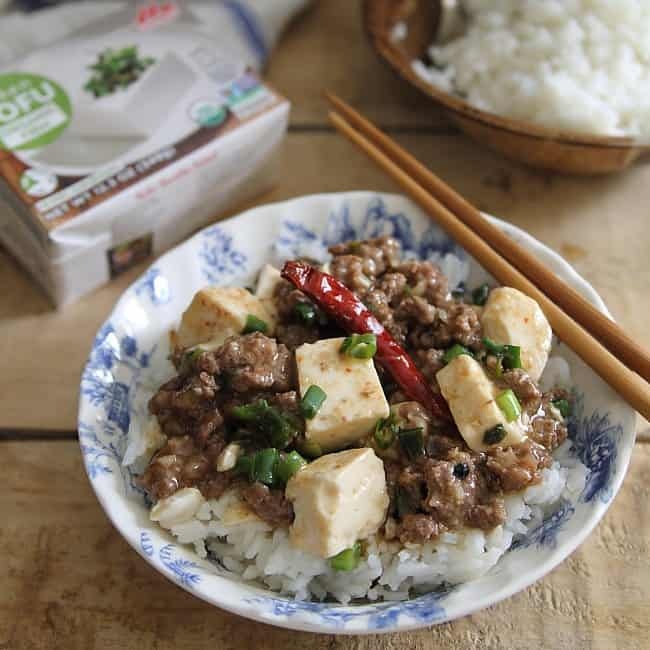 It’s spicy without burning your tongue off (just don’t actually eat those dried chiles in there) and I absolutely love the combination of the tofu with the beef. I’ve always only eaten tofu as the sole protein source in dishes before, never combining it with meat as if that wasn’t allowed. Well, duh, I’m not vegetarian, I don’t know why I thought that. Bring on the beef! 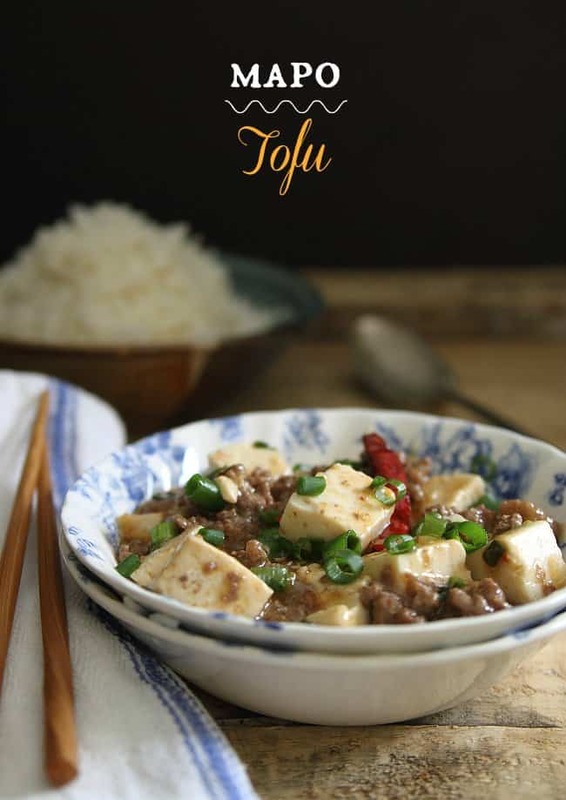 I’ve done tofu before but I’m usually trying to crisp it up and avoid it’s natural texture. This dish is made with Mori-Nu organic firm silken tofu and it’s a whole other ball game, folks. I always assumed silken tofu meant soft. It doesn’t. Mori-Nu tofu is a smooth, delicate variety that’s never pressed or drained so the texture is creamy and custard-like. The other cool thing about Mori-Nu is that it needs no refrigeration and has a year long shelf life due to it’s special packaging which seals in freshness. Their tofu is also certified Non-GMO which is pretty important to me when it comes to soy. Combine the beef, soy sauce, 1 of the minced garlic cloves and rice vinegar in a bowl, set aside. Combine the fish sauce, sugar, ginger, red chili paste and remaining clove of garlic in another small bow, mix and set aside. Once hot, add the dried chiles and peppercorns and cook for 30 seconds. Add the green onions, cook for another 1 minute. Add the beef mixture, break up with a spatula or wooden spoon and cook until browned. Add the chili paste mixture and stir until combined. Add the tofu and chicken broth and stir gently. Bring to a boil and cook for 3-5 minutes. Mix the cornstarch and water together in a small bowl, pour it into the skillet and gently stir. This will thicken the sauce a bit. Serve over white rice and garnish with additional chopped green onions. 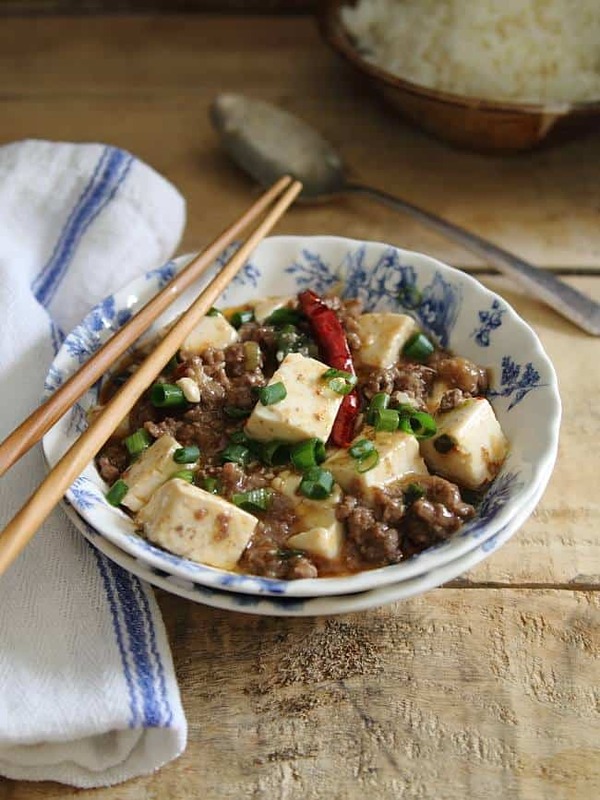 Gina. . mapo tofu is one of my FAVE Asian food dishes. . I love this, yo. We need more bloggers making Asian food and getting the word out just how easy (and so much better) it is to cook at home!! anyway, going to pin this like a million times so people see it! :P LOVE! Yay! It’s seriously so amazing. I was pissed when I left like 3 servings in the pan and my husband ate ALL of it for lunch. I wanted those leftovers!! It’s 11.14pm and I’m feeling hungry all over again. This looks super delicious, Gina, and I loveee silken tofu. You can also make hot plate tofu. Yum!! I have never made mapo tofu before! Definitely a delicious meal that I will be recreating for – thanks for sharing the recipe.. I love any Asian inspired meal! Really like Tofu that is a feature food of Asia. I will try to do it for myself at home. Thanks for your experience.